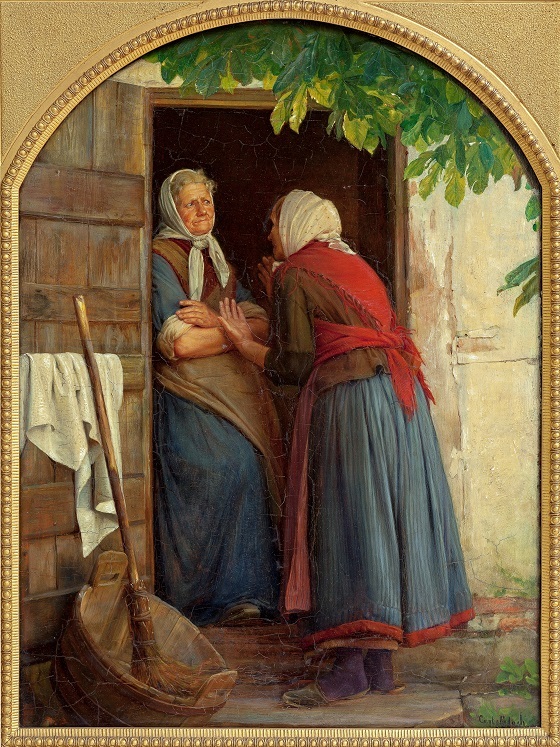 Two laundresses are standing in the doorway, chatting. The one speaking gestures passionately towards the other, who appears sceptical of what she is hearing. It was often the Copenhagen proletariat that was the subject of Carl Bloch’s genre paintings. He depicted everything from officials to street musicians to laundresses in humourous everyday situations. Common to all his paintings are the somewhat caricatured expressions and movements that Bloch added to all his characters. In this painting, the one laundress’ scepticism is made evident by her disbelieving facial expression and crossed arms, while the other’s gesturing indicates a deep insistence. The painting echoes the Dutch Golden Age’s witty and often exaggerated depictions of peasant life.